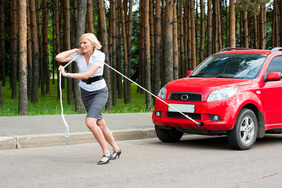 You can rarely predict when your car decides to break down but a bit of planning makes the best of a bad situation. If you breakdown on the motorway or dual carriageway, it’s important not to panic. Safely move across to the hard shoulder as soon as you spot an issue with your car. Drive as far to the left as you can and turn your front wheels towards the verge. Turn on your hazard lights, and turn on your sidelights if it’s dark. Don’t leave by the driver’s door. Instead, get out of your car via the passenger doors and stay well behind the barriers. It’s best to leave animals in the car, but in an emergency keep them under control on the verge. If you have a reflective jacket, wear it to make sure you’re seen. 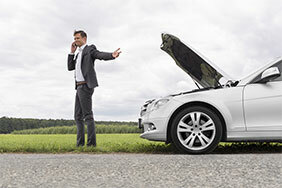 If you have breakdown cover, ring your provider and let them know where you are. If you’re not covered, you’ll need to call the Highways Agency for assistance. Look for the nearest roadside marker - these are marked in 100m intervals – and they should tell you where you are and will point you to the nearest emergency phone. If your car has been fixed and it’s ready to drive again, make sure you build up speed on the hard shoulder and watch out for a safe gap in the traffic before joining the carriageway. Keep an eye out for any other cars that may also be stationary on the hard shoulder. Fix or repair the issue yourself - it’s best to leave it to the professionals. Use your red warning triangle on motorways. Trying this will only make things more dangerous. What if I can’t get onto the hard shoulder? If you can’t pull onto the hard shoulder, immediately turn on your hazard lights to alert other motorists and call the emergency services for assistance. 1. Pull over to a safe place, away from the traffic. 2. Turn on your hazard lights, and your sidelights if it’s dark. 3. Place the red warning triangle at least 45 metres behind the car on the same side of the road. 5. Stay in the car and wait for help. You can call a local garage, which would normally charge a call out fee and also charge you for every mile they tow you. Another option is to call the Highways Agency and they should be able to tow your car to a local garage, costing from around £150. Alternatively, you can buy breakdown cover on the spot, where an additional fee of around £150 could be charged. If you’re setting off for a long journey, take a couple of simple steps to ensure you stay safe. It’s always handy to keep a breakdown kit in your car with a few necessary things like foil “space blankets” and high visibility vests in the car just in case your car ever breaks down. Make sure your phone is fully charged before you set off. It might even be worth investing in an in-car charger if you’re doing some serious mileage. There’s nothing worse than a dead phone after a breakdown. You can't predict when your car decides to break down but a bit of planning makes the best of a bad situation.